Born in 2001, Oslo, Norway, Outsourceit was created to tackle the challenges businesses faced when offshoring. Challenges related to communication, cultural differences, transparency, quality and more. We experienced that some overseas vendors promise their top team at the start and moved them to newer or bigger clients. This lack of priority received from these vendors meant we had no control nor continuity. We strongly believed there was a better approach in delivering international collaboration. A smarter way to bring talents and clients closer in a long term relationship. Then in 2007, we established our subsidiary in Ho Chi Minh City, Vietnam. Here, we built a service that would help businesses overcome the aforementioned challenges. A client centric approach- providing businesses reliable and stable access to top talents via full time employment. A people centric approach- where remote staff work as clients full time employee, treating them as their employer and becoming one of them. Our clients have worked with the same staff since the start of their agreement, recognizing we deliver what we promise. This recognition has been vital for our growth as we continue our focus on integrating more remote talents with businesses in an efficient manner. 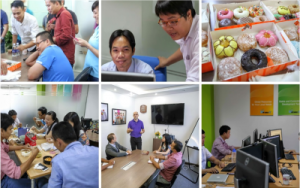 Outsourceit’s core values defines our beliefs and governs our daily behavior. Stability: We focus on providing our clients with a steady supply of workforce which ensures the job security for our employees paving the way for a future worth investing. Development: As a company we are continuously looking at ways to evolve and improve our performance to ensure what we provide stays relevant to our market.